Soil resistivity testing measures the capacity of the ground to pass an electrical current. This property utilises the electrical power industry for assessing the design requirements of earthing systems. SUMO provides soil resistivity testing services to assist in the design and installation of power generation plant, substations and engineering infrastructure. Standard soil resistivity testing procedure involves four equidistant electrodes set-out in a fixed configuration array. This is illustrated in the diagram below. A low-frequency electrical current runs across the outer electrodes and the voltage measured between the inner potential electrodes. The resulting soil resistance reading is then converted by standard equations into a resistivity reading. This represents the average resistivity of the ground between the potential electrodes. Depth readings from electrical soundings use an expanding electrode array centred on the same point. The depth penetration achieved increases in direct proportion to the electrode spacing of the array. Soil resistivity test equipment configuration and current paths. Earthing systems provide a safe outlet between an electrical circuit and the ground. The systems are for the dissipation of electrical faults, grounding lightning strikes and maintaining the correct operation of electrical equipment. Their design requires detailed knowledge of the resistivity of the ground in the site area. This measures depth at locations around the site, using an expanding Wenner array, standard BS EN 50522. This is called soil resistivity or earth resistance testing. The correct measurement of soil resistivity is particularly important in high resistivity ground. Specifically where electrical currents do not dissipate readily. In such ground conditions achieving a good earth can be problematic. 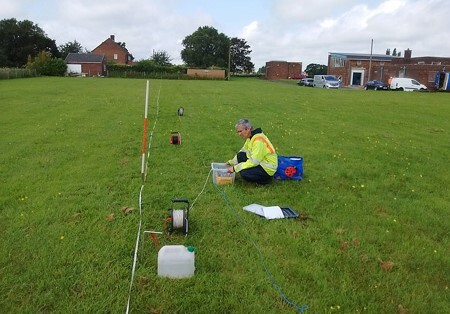 Information on ground resistivity is required in much greater depths for the successful installation of an earthing system. Inversion software removes the effects of electrode geometry from the data set and produces a model of the resistivity layers at the test location. Correlation with background geological data interactively refines the model and ensures it relates to actual ground conditions on the site. Soil resistivity equipment is also used on new earthing installations, to verify the system has sufficient capacity to dissipate fault related current and lightning strikes. This is known as earth-rod testing. The method measures the electrical resistance of an earth rod once it has been emplaced in-position in the ground. An adapted testing procedure termed the Fall-of-Potential (standard IEEE 81), uses two electrodes and a resistivity meter all connected to the installed earth rod. The current electrode is inserted in a fixed position, outside the direct influence of the earthing rod. Readings are then taken with the potential electrode spaced at set intervals in between the earth rod and the current electrode. The results are plotted graphically to determine the resistance of the earth rod. This will also gage if the earthing system requires additional earth rods. In addition to normal earthing applications, SUMO also carries out soil corrosivity testing. This assists the design and installation of pipelines and buried steel structures. Knowledge of soil corrosivity is critical for cathodic protection measures and coatings. This will also predict the effective lifetime of an underground storage tank (UST). Factors such as soil composition, moisture content, pore water chemistry, pH and redox potential all effect the soil resistivity. This is a principal diagnostic factor. The corrosivity test uses a standard Wenner array based on BS 1377 and BS EN 50522. This is to measure the resistivity along specific sections of a new pipeline route. Readings are usually taken where lithologies change. As well as at special situations such as fault zones and infilled channels. Surveys take readings down to pipeline depth at each test location. Longer arrays are required near water courses and at cross-overs where the pipeline needs to be embedded to a greater depth. The resultant resistivity data is converted into corrosivity factors and integrated into the design of effective protection measures.